Named after the almost all-powerful dark spirit from the Lord of The Rings, the Sauron dinosaurs roamed Africa some 95 million years ago. 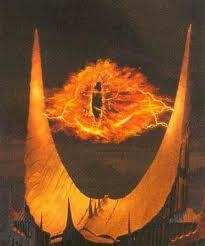 The species was named Sauroniops pachytholus, which more or less means “The eye of Sauron”, and it was identified so far from a single fossil found in Morocco. The fossil had only a part of the skull including the eye socket, study leader Andrea Cau, of the Museo Geologico Giovanni Capellini in Bologna, Italy, explained. “The skull bone of Sauroniops is very broad and particularly thick: This suggests an animal as big as Tyrannosaurus [rex],” Cau said. But without more fossils, “a more precise estimation of its size is currently impossible,” the paleontologist added. 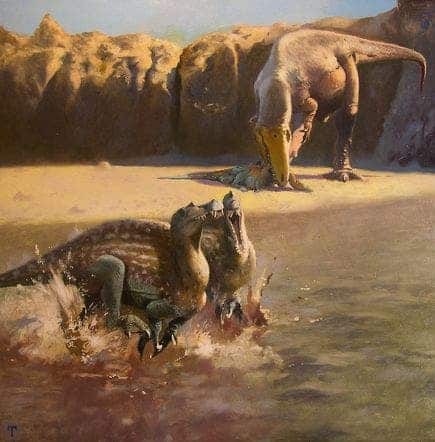 The study revealed the dinosaur had a specific bump on its forehead, setting it apart from its carcharodontosaurs cousins; the bump was probably useful for male on male head-butting clashes. Sauroniops isn’t the only ferocious predator of the time found in the area; the abundance of predators has a rather simple explanation.